Here is a new e-mail template I designed at work. This e-mail will feature recipes, tips and paid advertisement and will be sent out several times per week to a list of subscribers. Click on the photo to see a sample email. I am happy to announce the launch of a site I have been working on for my employer. 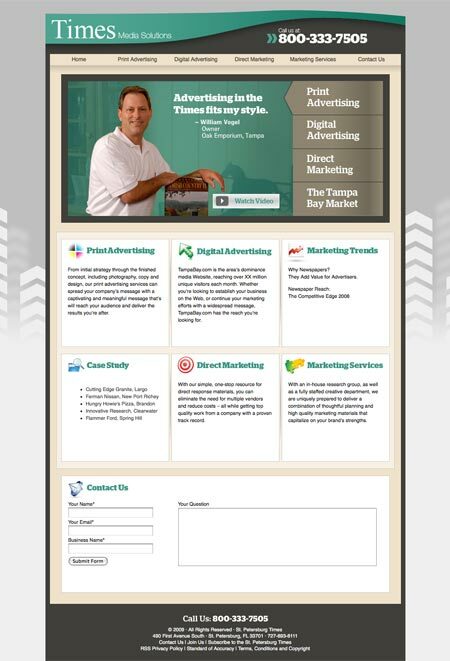 It is a media kit for the advertising and marketing departments. Check it out at http://www.tampabay.com/mediakit. This is a pretty comprehensive site with nearly eighty pages of content. I especially enjoyed creating the interfaces for the video case studies and the slide shows of sample works in flash. I also enjoyed working on the icons that appear throughout the site. You are currently browsing the designspot blog archives for November, 2009.